I’m thrilled with the results. I love our menu board! All I have to do is change the paper in the frame and it gives the menu a whole new look! I’ve already had several compliments about it. I also love it because now I have a clear reminder of what’s for dinner (so I always remember to transfer the meat from the freezer to the fridge the day before it’s scheduled to be prepared). In addition, I love that I don’t have to carry that weekly menu in my brain (having a baby in the house has given me a bit of the old brain vacuum syndrome). It has also helped in a way that did not expect… my husband sees what’s on the menu and he will often start the dinner for us (how great is that?)! I love this. 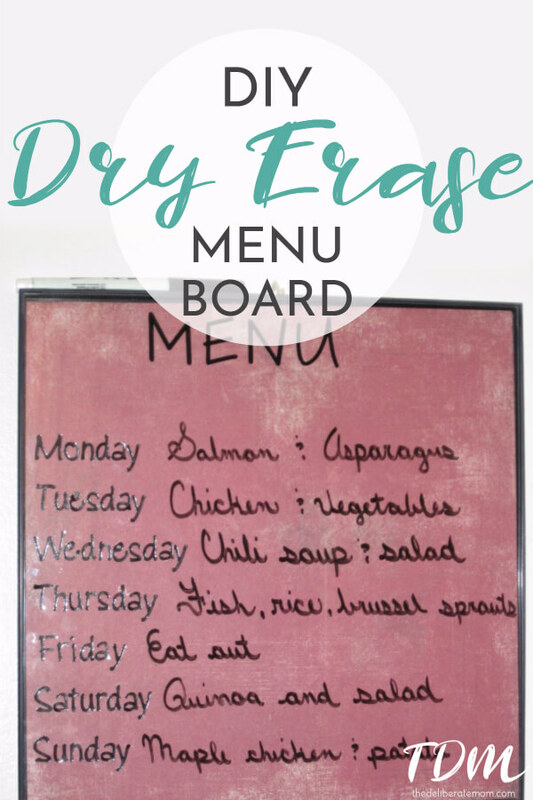 Making the menu board pretty is one way that will make me want to use it! haha. My husband would eat a large late lunch at work and tell me he was to full to eat on the nights that he scoped out the menu and didn’t like what he saw. So I have to keep my menu top secret. I have a house full of annoying, picky eaters. Lol! In love that…especially my daughter who has a gluten free diet!!! We do and its great! Hubby knows what to start, we’re getting through the mystery stuff that’s in the back of the freezer and have way less emergency stops at the grocery store! I saw that tutorial. I want to try it too! It’s an awesome little menu board! Definitely give it a whirl!